To become a fully fledged member of the Rebel Legion your costume needs to be submitted for clearance. During this process a Legion Costume Judge (LCJ) will compare your costume to a pre-set criteria for each costume, known as the costume requirement list (CRL). These costume standards are the minimum level of accuracy that the various costume detachments have outlined to be required to qualify for approval. For many costumes there are additional details that can be included in your costume and we recommend that each costume try and surpass these minimum requirements where possible. Before you submit we strongly recommend that you post your chosen submission photos on your WIP to ensure that the Detachment leader or Costume Specialist is happy that everything is present and correct in your photos. This also includes ensuring that the photos show all the detail required for quick and accurate judging. For tips on how to take photos see the bottom of this thread. Once your Detachment Leader, or Costume Specialist gives you the go ahead to submit you need to log-on to the Rebel Legion forum. The submission of any costume for the Rebel Legion is only done via the main Rebel Legion forum so before your ready to submit take the time to register a user account on the main forum and get familiar with forum. Once you are logged in, find the ‘ My costumes ‘ link that will take you to the my costumes page. This is where all your costumes will be listed once you have cleared more than one. Click the “Add a costume Link” to be take to the submission form. From the drop down menu select the category your costume falls under. This will be the same as the detachment your WIP is placed in. The category choice will open up a few extra optional fields to fill out which are biographical in nature. Character Name: If it’s a ‘face character’ (Specific Character from the Star Wars Universe) use the correct characters name at the time they are wearing the costume. For generic costumes ( non-specific costumes) you can create a character name in keeping with those found in the Star Wars Universe for the type of character you’re submitting. The alien Species should match the type of character you’re submitting. The character/costume description is best used for writing a brief break down of your costume, details here are welcome in particular fabric choices and listing the components of the costume. For a costume with no standards you should go into further detail as this will be used as a basis of the costume standard. 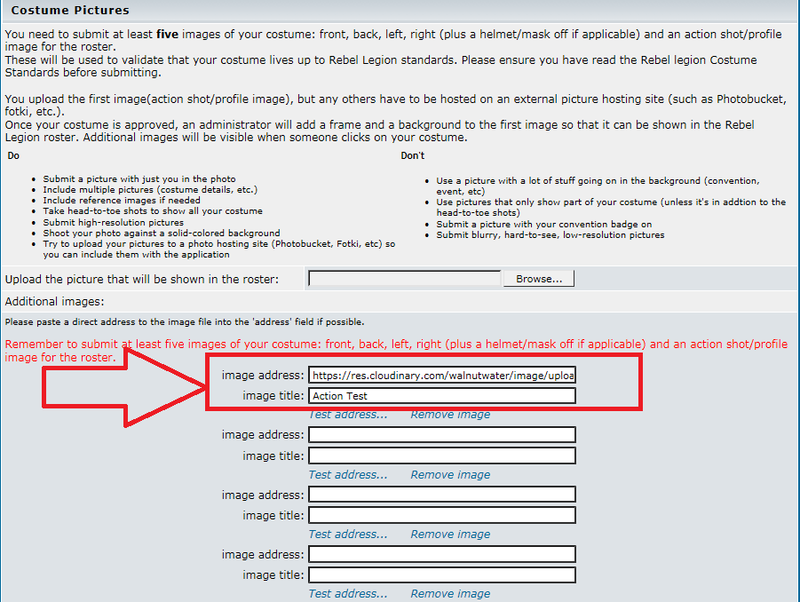 Only your action pose\rosta photo is uploaded directly to the Rebel Legion server. All other photos for your clearance need to be uploaded to a photo hosting site of your chosen. Create an account and upload your submission photos. Click on the image which will zoom into the image. Avoid using the share options as they will not work in the submission - any forum of html coding or short url will be invalid. Paste the copied url into the dialogue box and then give it a name below eg: Front, Back, Left, Right etc. *IMPORTANT* Please ensure that you test the link! Do this for every photo link you add. If your link doesn’t work and you submit it will slow down your application process. It is your responsibility to ensure the photo links are working. You can add more photo links by clicking on the “Add more” link. For Legion first costumes or costumes with no standards please upload some reference photos. If you have many reference photos then create an album on your photo hosting site, and copy the link and paste that into the Costume Description bx. Once you’re happy click submit! You're done! Once you've hit the submission button you'll see the confirmation that your application is winging its way to the costume judges. The judging process takes around 1-3 weeks, and is based on a queueing system,so it will depend upon; how many costumes are in front of you, how many judges are clearing costumes in that detachment, that the application is complete, the photo links work and that there is no modifications required. A email will be sent to you as confirmation that the costume has been submitted. This is also sent to the Base Commanding Officer (BCO), Base Membership Officers and the Commanding Officer\Leader of your base detachment. A costume judge will email you when they have been assigned your submission, and will only get in touch if they need further information\details about your costume from you. They will also get in touch if any modifications are required. I cannot stress enough that if a costume is modified this is no slight on you, just that the costume may be missing some detail that needs to be included to meet the costume standards. You will get two weeks to make any modifications required and once they are complete you just need to send photos of the modified costume part to the judge. In many instances you wont be required to do a full kit-up. Please ensure that you reply to the costume judge as soon as possible and also that you remain civil and courteous. It is one of the hardest roles in the Rebel Legion and at times a thankless task. On that note if you disagree with the judges decision and have supporting evidence that your costume is correct we recommend that you contact the BMOs who will be able to help you further. When you're taking photos of your costume submission please try and ensure that you are using the best camera you have available. The bigger the final image resolution the easier it is for the Judges to see details and hopefully not need to request further photos. Modern mobile devices tend to be sufficient but please ensure that the lens to your camera is clean or the image will be blurry. •Take photos of ALL sides: Front, back, sides all at full length. •If you have a helmet, mask, or outer robe, take photos with and without the extra piece, especially the outer robe as it may hide many costume details. •Some costumes have lots of little detail pieces that the standards require, like a broach, special seams, hair pieces, extra pockets, food capsules, etc. Take photos of them. The judges go down a checklist to make sure all things are present. Taking an individual photo of them will help with this far quicker. •Make sure the photos are in focus. If you send in blurry photos, you will probably going to be asked for new ones. **If shooting with a DSLR or any camera with a manual focus, ensure photos are in focus, zoom in as close as you can to the person's eyes/face. On automatic focus, half-hold down the shutter so that the camera acquires this as it's focal point. On manual focus, simply focus in on their eyes. Then, with your focal point acquired, zoom out and take the full body photo. •Make sure your photos are well-lit. Optimal photo conditions are outside on a cloudy day or in a shaded area. Direct sunlight can make for over exposed images with burnt out highlights, while the costume may be lit it doesn't look good when photoshopping. Conversely too dark it will be hard to see details on darker fabrics and belts etc. If you have to use flash on your photos, please make sure they're not washed out. •Plan neutral coloured backgrounds are preferred; white or grey walls are ideal, this will help ensure accurate representation of the costumes colour. **Please do NOT stand against a wall that is the same shade/colour of your costume. That makes it incredibly hard to photoshop. If possible stand a good couple of meters away from the wall as again this makes it easier to photoshop. Personally, Cloudinary is the hosting service I use. It offers a free account that lets you host up to 10 Gb of media and over 20Gb of monthly viewing bandwidth (Used if hosting a Web Site) - but for the hosting of pictures, it’s very versatile. It allows a drag and drop for the upload of pictures and allows you to sort them into albums. It offers different viewing possibilities but I’ll try and outline the best way to use it for hosting forum/clearance pics. Once you have created a free account – you have access to your own dashboard and media library. The dashboard gives you a quick overview of the plan you’ve got, available storage and the bandwidth used to look at your pictures. The media library is where you can view, edit and add photographs. The first thing you’ll need to do is create a folder for the project you want to do. This is an important step as you can host them all in the top level but it can get pretty messy, pretty quickly if you host many pics. Selecting a folder from the folder list takes you in to that folder and clicking the cloud can take you back to the top level. Now that a folder is created, it can start to be populated. You can add a photo (or multiple Photos) by dragging and dropping into the dotted box or you can select the button to search your computer for the photos. Ive added 5 photos from my previous X-Wing submission as an example. In the black box, at the bottom of the pic, you can see the web address that the image is now hosted at – This can be copied and pasted in to the respective box on the http://www.rebellegion.com/ submission page. And again, as noted by Mark, Please test the links – the image should be brought up in an internet tab. If it’s successful – then the image has been successfully hosted! Cloudinary also gives some limited image editing, crop, rotation, ratio and some effects. It can also be useful for hosting images on the forum – returning to the link in the black box – this can be copied into a forum post and put it between an image tag ([imgl] [/imgl]) to see it in your post.